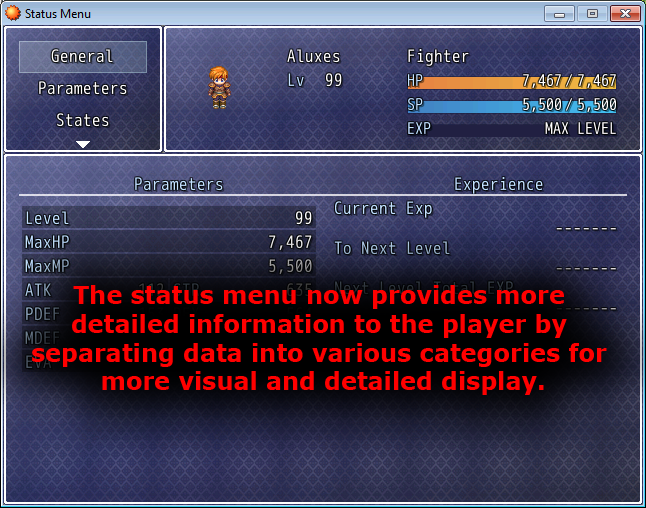 The status menu doesn’t appear to help much at all in the default RPG Maker XP scripts. 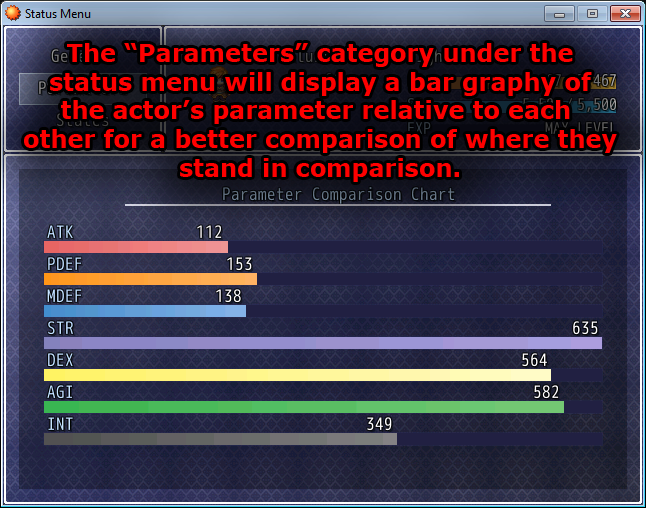 This script changes the status screen completely to something the player can interact with more and be able to view actor data with more clarity. There is a high possiblity that any script that rewrites Scene_Status will have conflicts with this Engine. Scripts that may conflict with this Engine are stated in the comments in the "SECTIONS" and "Script Conflicts and Compatability". I think it would be nice if it had a button configuration area within the script like in Blizz-ABS. But good job on the script, it's pretty good. Oh, by the way, that link you gave leads to your Option Scene instead of the Status Screen. I've never really used Blizz-ABS, so I don't know what your talking about . Also don't know how that happened but the link is fixed. # This module provides in-game control configurations. UP = "Key['W'], Key['Arrow Up']"
LEFT = "Key['A'], Key['Arrow Left']"
DOWN = "Key['S'], Key['Arrow Down']"
RIGHT = "Key['D'], Key['Arrow Right']"
Oh you mean something that allows you to choose which button inputs the player can use during game play? I don't think that that would really go with this script. You can't just take some unrelated feature and throw it into a status system. Oh I wasn't, I was just answering his question. I have all planned add-ons already, I just haven't codded them and this is not one of them. Sorry MOAL, but Thallion is right this feature is not needed. Um Im having a problem with the status menu. When I select commands such as equip, status and arrange where you need to select a character, whenever I scroll down through my characters the selection on the command scrolls down as well sp if I scroll to my second character the selection on Status scrolls down to Save and if I scroll to my third it scrolls down to End Game. Okay, I'll take a look after I've taken my exam tomorrow. Before i look, did you test this in a new project, if it doesn't happen then it's possible a script your using, but I'll take a look anyways tomorrow. I can confirm that it still occurs. It's really just a matter of active= set to true/false at the appropriate times. I guess I'll have to put it in a new project as none of that you have explained is happening. Okay never mind I see what the issue is it's in Window_Selectable. In my project I for some reason have two versions and I submitted the version that still had the cursor_movable? un-updated. Try redownloading and tell me what happens. Alright now its working fine thanks for the assist Your scripting knowledge deserves to be notified. While browsing Youtube, I somehow came upon this video of one of Yanfly's scripts. At 2:12, the status scene looks EXACTLY the same as this script's. And it's not just this script--that Formation scene also looked a lot like something you were working on back then. I think you should at least mention the scripter's name that you copied the design from in your scripts. Maybe not credit them, but say "Design influenced by ___" or something along the lines of that.